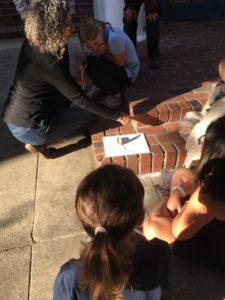 On Thursday October 11th, the Plant Power project had their first session at Doug Adams Gallery in Berkeley. 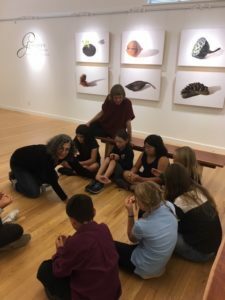 They viewed a gallery on seed pods and their shadows. Hagit Cohen, the photographer behind this gallery came and talked to the project members. One of the project leaders brought in some dried seed pods and to recreate what Hagit did, they took photos of those seed pods in the sun. They also went on a small nature walk around the block to look at plants and seed pods we can find on the streets. Afterwards, they wrapped string around dry papyrus stems while making wishes. This session went really well. The kids went home happy and excited for the next session. Below are some photos. The one on the left is of Hagit showing the kids some of her dried seed pods. The one in the middle is of Hagit demonstrating how the sun casts a shadow on the plant. 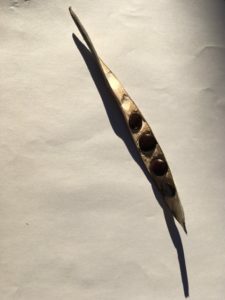 The photo on the right is a photo that one of the kids took of a seed pod and its shadow.